Will Gosnold takes the first reading on the gravity meter. Photo by Richard Larson. 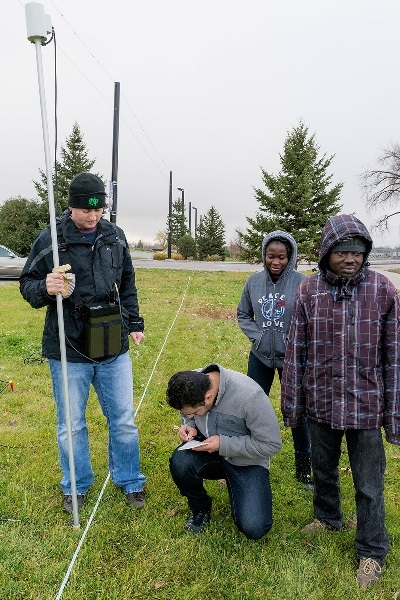 It was 8 a.m., on a chilly Saturday, and Will Gosnold’s Introduction to Applied Geophysics students were at class – and smiling. They figured they were on to something big. The classroom was the bank of the Red River, along the East Grand Forks Greenway. That’s where they, in addition to a few graduate students who weren’t members of the class, sought the remains of a legendary bootleggers’ tunnel rumored to have run from the river to the basement of the original Whitey’s Restaurant nearby. 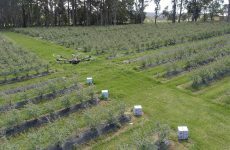 The students spent four hours running tests in the field. And later, back in class and in the labs, they spent even more hours running the data. And the result? “There’s definitely something there,” said Gosnold. The seismic reflection profile shows what might be a hollow cavern under the river, probably about 20 feet across.” He added that there is a hint of concrete that may have been used to fill part of the cavern. “I’d love to go back and do more,” said Gosnold. “I think there’s big stuff down there. They did the work, he said, as well as the calculations. And they will continue to run more calculations to see if they can learn more. 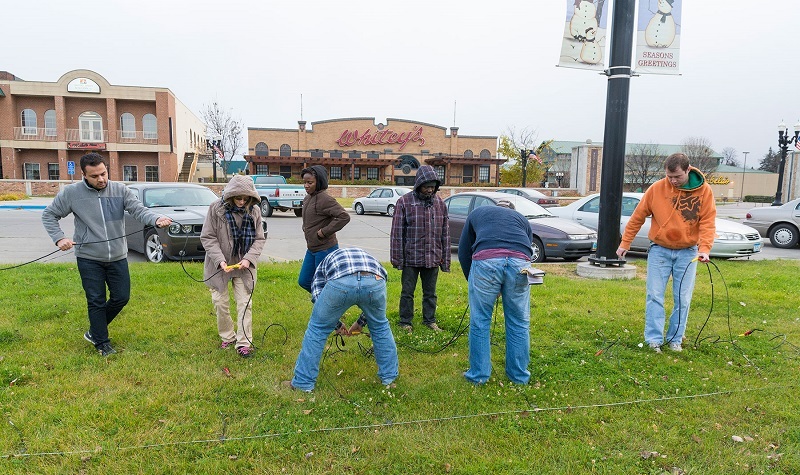 Advanced geophysics students lay out geophones as they prepare for seismic testing. Photo by Richard Larson. During Prohibition, Whitey’s was at the center of a notorious speakeasy and gambling operation. It was one of 40 nightclubs that lined DeMers Avenue, giving East Grand Forks the nickname “Little Chicago.” Today, Whitey’s, still up and running, is the only remaining establishment from that era. After the Red River Valley Flood of 1997, the first floor of the original building was covered with nearly six feet of water. Whitey’s was rebuilt three doors up the block, and its iconic “Wonderbar” and art deco interior were saved. There have long been rumors of a bootleggers’ tunnel, and Gosnold thought it would be a great experiential learning opportunity for students to seek signs of its remains with sensing technology. 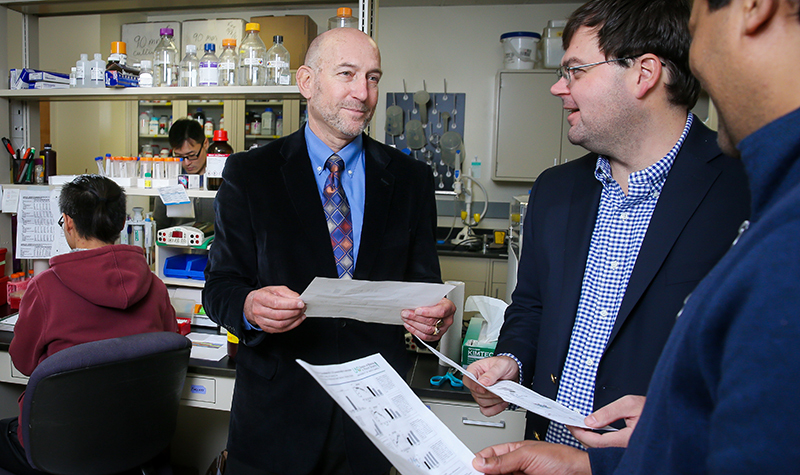 “Students enjoy learning so much more when it’s hands-on,” said Gosnold, a Chester Fritz Distinguished Professor of Geology & Geological Engineering. Rory Koch holds the magnetometer while Omar Alomar takes readings. Ogochukwu Ozotta and Kayode Olatunji look on. Photo by Richard Larson. Gosnold obtained permission from the East Grand Forks City Council, and gave his students a take-home exam so they could plan the project and develop cost estimates. Once on the Greenway, Gosnold and his students used reflection seismology, gravity, magnetics and electrical resistivity equipment as well as high-resolution GPS. Gosnold knew that some of the techniques wouldn’t yield results, but would pay off in experience for the students. He did expect, correctly, that the seismic reflection survey would yield results. 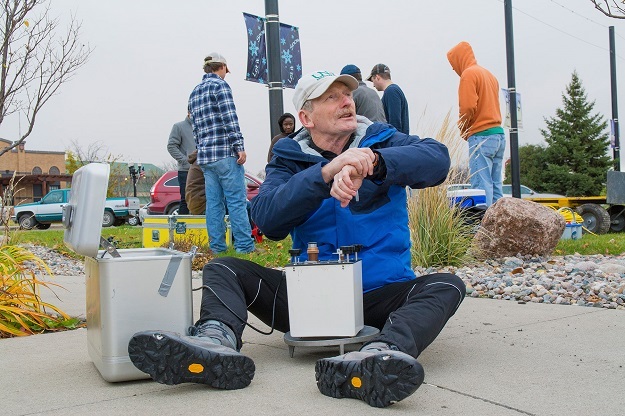 The device, designed by a UND graduate student and patented, is known as the BOSS (Ballistic Ordinance Seismic Source). They laid out about 48 geophones along the rumored tunnel line and measured seismic waves after firing a blast. Then the students ran and interpreted the data, which took about two weeks. “In geophysics, we generate mathematical descriptions of Earth’s properties,” Gosnold said. And now, he said, computers can generate graphs and maps using that data. Geological Engineering senior Ryan Limesand said there’s a lot of arithmetic in the geophysics course. Excel computer programs help with the numbers, but they still have to understand and interpret the information they’re getting back. 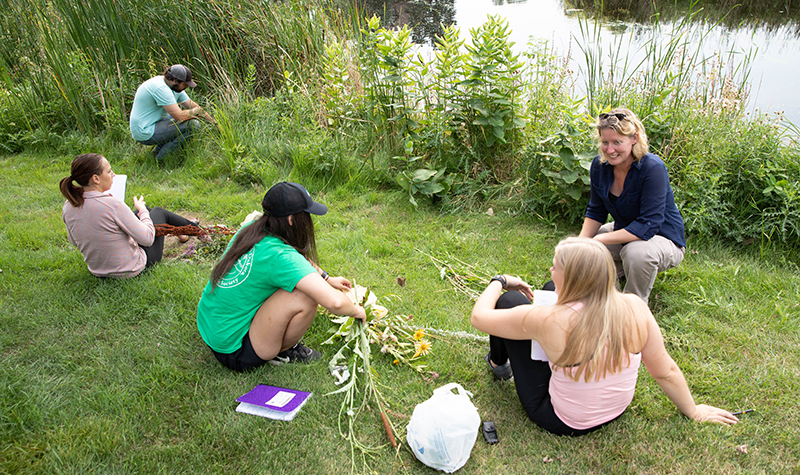 “It was fun to get out there and do things we talk about in class,” said Limesand, a native of Bowman, N.D. “It’s easier to visualize what’s going on rather than look at equations.